It’s not every day that you see robots doing sit-ups, nevermind doing sit-ups to the point where they actually break a sweat. What manner of hell are these scientists unleashing on us? Do they expect robots to train in robo-gyms and get buff before chasing us all down with these muscles and taking over the world? It sure seems like it, but these scientists claim this is important to aid in research for better crash test dummies and in other fields. 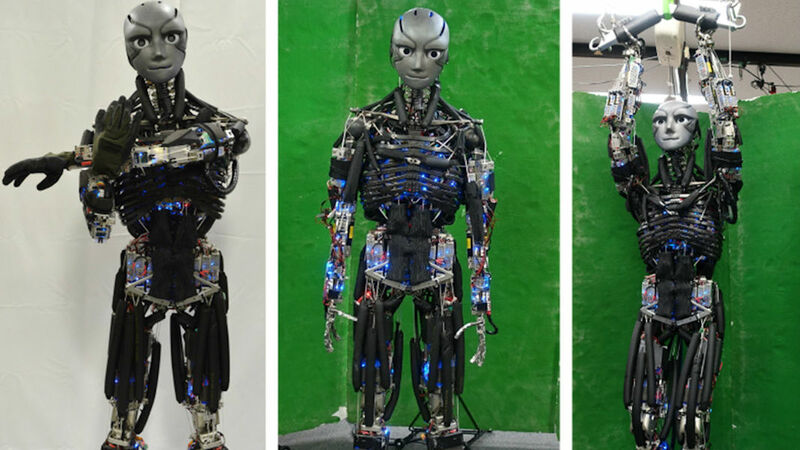 These robots have anatomically correct musculoskeletal structures like spinal joints and their body mass and proportions resemble that of a human’s. These two robots specifically are named Kenshiro, modeled on a 13-year-boy, and Kengoro, a newer robot that is slightly heavier. These robots do actual workouts and Kengoro even sweats like a human. The sweating feature is designed to cool the bot. Watch as these bots perform pull-ups, sit-ups, swing a tennis racket, and more. You can easily picture a scenario where these robots workout to a training montage similar to the Rocky movies, except that this montage will no doubt end with them using their muscles to round us humans up so they can rule the world. All I know is, watching robots work out is downright creepy.